During the mid-1600s in Rome, two artists – each with a particular genius – appeared on the scene, left their imprint on the city, and shaped its aesthetic sensibility. Gian Lorenzo Bernini and Francesco Borromini, whose stunning masterworks, such as Bernini’s Sant’Andrea al Quirinale and Borromini’s San Carlo alle Quattro Fontane, exemplify the dramatic and theatrical nature of the Baroque period. This Rome art tour explores 17th century Rome, a time of immense wealth and artistic growth. 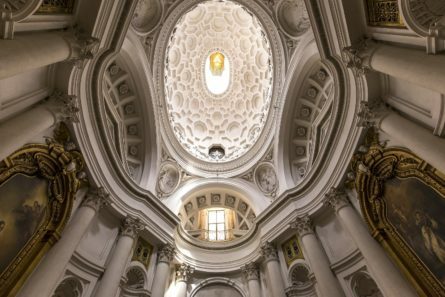 In this tour through the Quirinale neighborhood of Rome, you’ll dive into the Baroque period and the artistic ideas that fueled it. The discussion will include the roles that politics and religion took in the art of the period, and we’ll focus on the biographies of these two artists whose lives contrasted as much as their art. This is an ideal Rome art tour for anyone who’s interested in art and in learning more about the artists who helped to shape the Eternal City.